WordPress 3.8 redesign, SEO improvements, full width slideshows, “no conflict” mode, CSS enqueueing changes, Insert Slider button for posts. 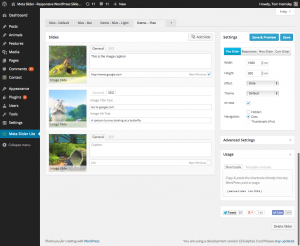 WordPress 3.8 comes with a brand new, modern admin design. We’ve been working to bring the Meta Slider interface inline with these updates, and have taken the chance to de-clutter and simplify the interface at the same time. The main slideshow settings section has been stripped down to the basic slideshow settings (Width, Height, Effect, Theme and Navigation options), and the more advanced settings have been moved into their own collapsible box. 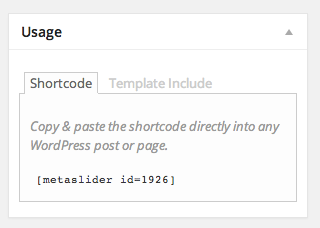 In a previous blog post we mentioned the new ‘percentwidth’ shortcode parameter. This still works as it did in the past, but additionally it’s now possible to set a slideshow to ‘Stretch’ in the slideshow settings. 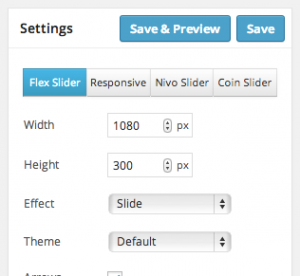 Quite often, a conflicting theme or plugin will do a blanket initiation of FlexSlider for any HTML on the page with the class ‘flexslider’. A quick one – in version 2.6 you’ll find a handy new “Add Slider” button just above the WYSIWYG, making it easier than ever to embed your slideshows in Posts & Pages. We’ve added a new “SEO” tab to image slides. It’s now easier than ever to add “title” and “alt” attributes to your slides. Unfortunately this has meant adding a smidge of complexity to the previous “it can’t get much simpler than this” interface for image slides, but we hope the extra functionality more than makes up for a slight change in appearance. This will be a welcome change for some and a pain to others. Unfortunately there is no solution which will please everyone (sorry!). In 2.6, we’ve changed the CSS includes back to using the standard wp_enqueue_style() method. This will output your stylesheets right at the bottom of your page. The upshot of this is it is now possible to use minification or caching plugins to shift these style includes to the <head> of your page, to get HTML5 validity. If you have any comments or questions, or have idea’s on how we can make Meta Slider even easier to use (even if it’s just a change to how we word a setting!) then please let us know below!